High School: Phaung Daw Oo Monastery High School (Buddhist Monastery School), Mandalay, Myanmar. Major/Degree: Planning, Public Policy and Management. What I learned: What I have learned is dream, plan, work with commitment and passion, then you will achieve what you want. If you don’t have a dream, there won’t be a dream come true. So, please dream big and go for it with your heart and soul. However, we need to remember that there has to be a plan and work to go with the dream you have. Then, we can be whatever we want to be in life. Favorite spot on campus: The big tree in front of Deady Hall. The trees is gorgeous and the scenes around it are like a perfect movie. I always want to climb that tree or shoot a romantic scene of a movie under that tree. Favorite memories: The first favorite memory is International Student Orientation. I will never ever forget the amazing two weeks of events meeting all international students from many different countries. We learned much about studying here at the University of Oregon and as well we got to know one another during the event. Then we all became friends for all these years and will remain friends for the rest of our life. My other favorite memory is the year of Big Snowfall. I have never ever witnessed so much snow in my life. Favorite professor: This is the most difficult question since there are a lot of great professors in PPPM. I do hope I can choose two professors for this question. I will say Bob Choquette and Gerardo Sandoval. They are just simply amazing. They are very professional with what they do, they teach and help students with genuine care. What it means to be a Duck: It is like the saying, “Birds of a feather flock together.” We Ducks are one community and we care about one another. We like to look at our life in how we can make a difference positively in community and other people's lives. We try to shape ourselves with education, so that we can shape the world into a better place. What I did for fun: I like doing outdoor activities with my host families. Oregon is beautiful. So I better enjoy when I can. So I often go out with my host mothers, hiking, camping and walking on the beach. There are endless things to do for fun in Oregon. What’s next: I would like to work for a year before I go to graduate school. I want to work for my country one day, so I would like to build my capacity building. 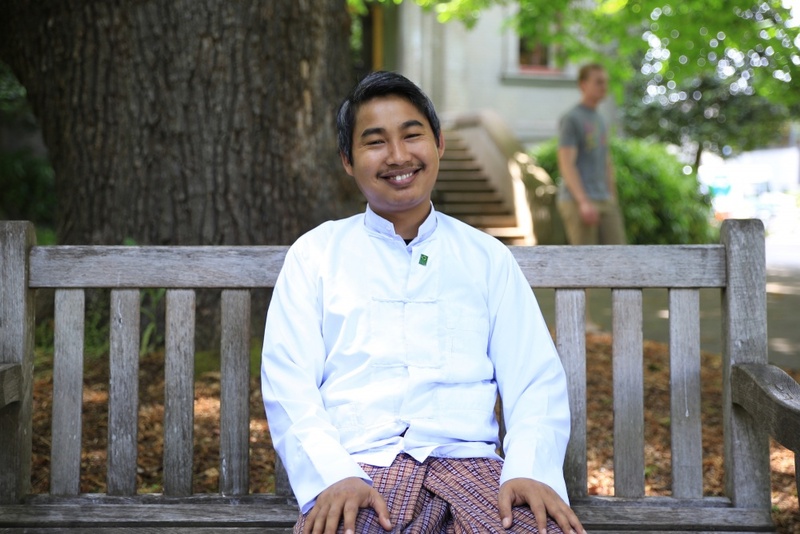 I want to serve the people of Myanmar/Burma and be a part of the change.